We’re getting close to the private test. Here’s the big things I worked on this month. Take a look at the end of the post for some information on when the private test will start. So in my last post I mentioned some issues I was having getting the animations necessary for testing. Since then Mixamo has been fixed and I’m now working on getting all of the animations working in game. 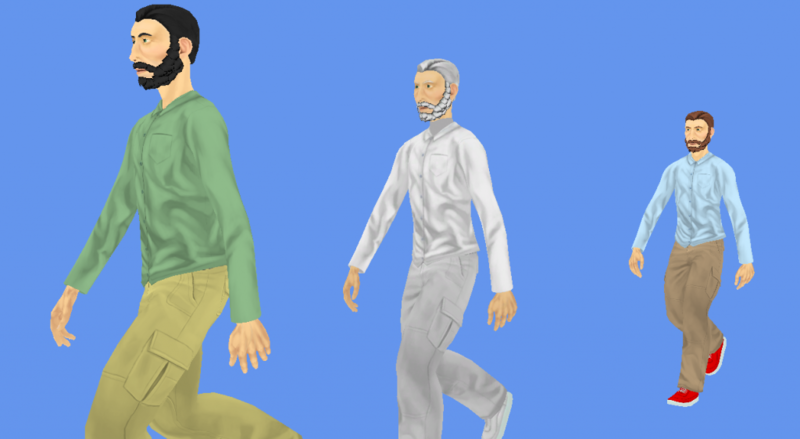 The process involves getting animations for all of the primary actions, which are generally movement. And then animations for secondary actions, like holding objects or using them. Then we combine those animations in game to show the character. Here’s an example of what that will look like. So in this case we’re taking a walking animation and combining it with an animation of holding a rifle. I’m also moving the head up and down, so I can give a better idea of where the player is looking. It’s not a perfect solution, but it allows me to animate the characters better without needing to have separate animations for each combination of object and movement. The included animations will be for test only. 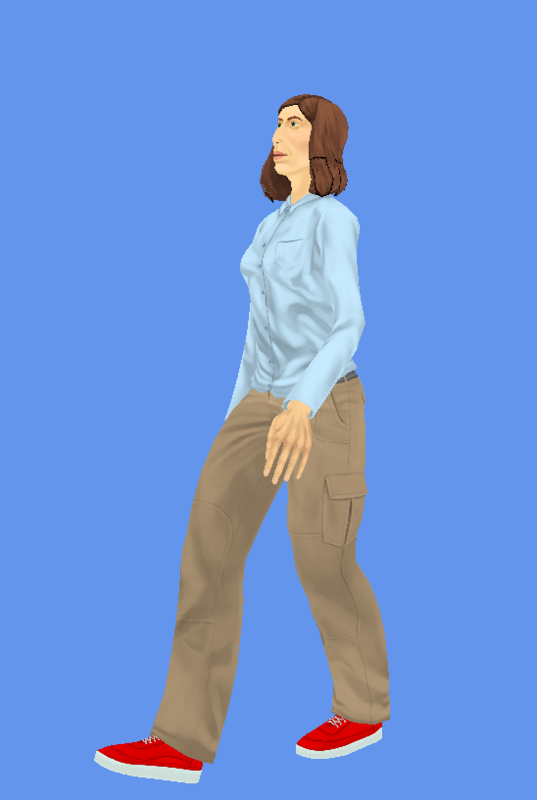 In this case you can see the stock animation deforms the wrist of the model pretty bad. There’s one item missing from the above gif, the actual items. That’s generally the final step in getting a working animation into the game, making sure all of items position themselves appropriately. I’ve got a separate application I use to fine tune the position of the items on the character, which I’m doing as I bring in the new animtions. Last month I showed the crash reporting system, but not every issue in the game will cause a crash. 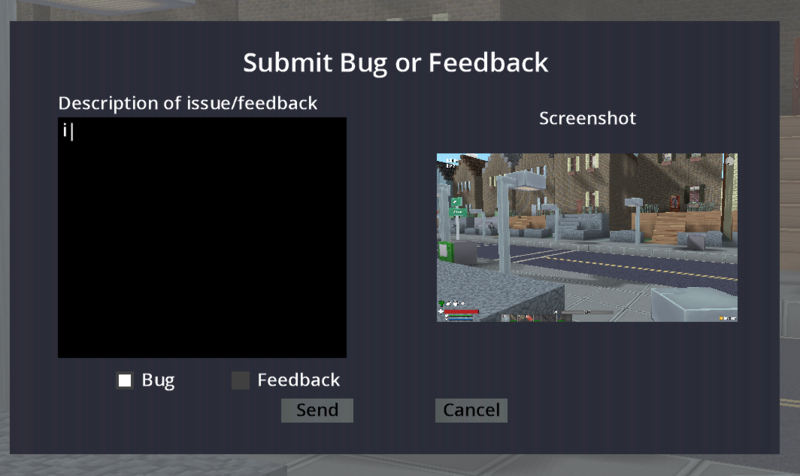 I’ve added a bug reporting system in game to cover the other types of issues. Simply press B+U+G at the same time to bring it up. You can then give a short description of the bug and a screenshot will be sent along with it. You can also just send feedback if you think something should be improved or changed. So I can now announce that the beta test will start on 10/31! In order to participate you’ll need to join the following Steam Group. All members of the group will be given a key they can use to install the game. All you need is a Windows PC and a Steam account. We’re getting closer and closer to have a test build ready. Here’s some of what I’ve been working on this month. So last update I talked about the new character models. This month was about getting them in game. I wasn’t able to complete that process entirely, but we do have them rendering in game with the appropriate shadows/coloring. The last issue to resolve is to get them animating properly per player input. I was hoping to have this done already, but I’ve hit a snag with the system I’m using (Mixamo) that’s preventing me from getting all of the test animations I need. Hopefully the issue will be resolved and I can get them in soon. Note these will be test animations only, they will not be final. In the screenshot below you can see one of the characters in game. So the above screenshot was made possible by having two players in the same game via Steam’s matchmaking service. This is an item that’s been in the works for a while, with bits and pieces being done. This month I was finally able to put it all together. It’s based on Steam’s P2P network layer, so it should be able to deal with routers and related issues without having to open up specific ports. The goal is to replace this with a full Server/Client implementation at some point during Early Access. I got a question last update about female characters in Deadburg. The work done on specing the models was done with female models in mind. I’m not sure if all of the final animations/models for female characters will be done at the same time as male characters, but it’s something I’m working to include. The closed test may not have a female model initially for example. Here’s a shot of the female test model. Again none of the current models/animations are final. So I’ve mentioned this in the past, but wanted to circle back now that it’s implemented in the game and working. Basically if the game crashes you should see a pop-up like below. This will give you the option to send us information about the error. It also includes some basic information about your system, like your CPU, GPU, RAM, and OS information. It does not send any personal information or information that could be used to identify you or your PC. You do not need to send this information if you don’t want to, you can simply exit out of the reporter. The process of sending the information does not require your e-mail or any account. There are two “big” items in the way of the closed tests starting. 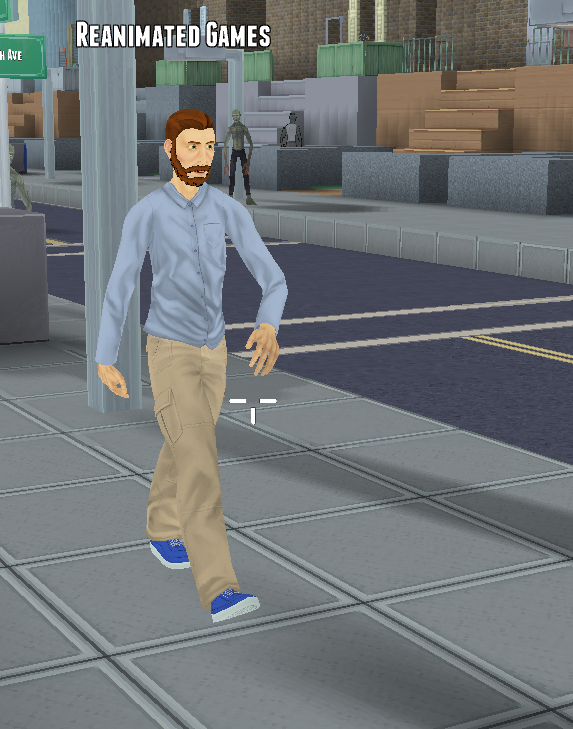 The first is getting all of the test animations in for the player character. I know the Mixamo folks are working on the issue, but they haven’t provided a specific ETA. The other issue is that there’s a good chance I’ll be moving here shortly, and if so I’ll probably want to get that done before starting testing. So I don’t have to go dark for a few weeks during the move. My goal is that the September update is announcing a date for the start of closed testing. The closed test will be mostly open to any current fans of Deadburg. There will be information here along with the various social media accounts. And if you joined the mailing list you’ll get an update there. It will be a closed test in that you will need a code from me to join, but as stated, everyone who wants one should get one. I’ve been asked about the requirements for the closed test. I’ve not finalized them at this point, but generally it should be fairly simple. A Steam account with the Steam client installed. This is how the test builds will be distributed. Sorry for the late update on July. I’ve been working on two related items. The first is getting some kind of player model into the game so that it can be tested. The Xbox Avatars are gone, so they need to be replaced. I’ll discuss that process a little bit, and where I’m at currently. The second part is working on a spec for the next big art item, which is animations. The work to replace the avatars is probably the largest part of the PC port, at least in terms of getting to a testable version. The avatars offered a ton of customization, and while we won’t be able to match that with the Deadburg models, the aim is to enable as much of that as I can. Right now I’ve got an early version of the characters animating using some stock animations. This took a lot longer than I would have liked, but it should allow me to move forward with a test version a lot faster than if I had to wait for custom animations to be done. 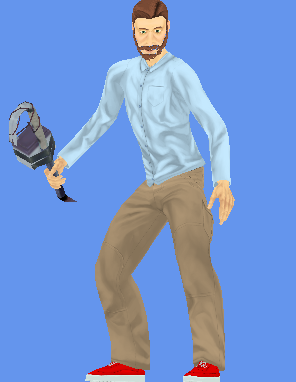 I’ve also got the mesh recoloring working so we aren’t all running around with the same character for the test builds. Here’s a shot of the test app I’ve been using to get the animations working. The current character has 8 parts that can be swapped in/out and colored; head, hair, facial hair, chest, arms, hands, legs and feet. This should allow us to have clothing that you can either customize pre-game or find in game (Depending on how much there is, and if clothing affects game play). Note the current art is not final. The models are animating/coloring in my test application. Right now I’m working on getting these into the game, which is one of the last big things I need to finish before I can open up the testing. One of the more lackluster parts of the original Xbox release was the lack of first person animations. Mostly this was an issue of the avatar models being difficult to animate, you needed specific versions of software that weren’t in use anymore. In the PC version we’re going to have real animations in first person view. A good chunk of this month was figuring out the spec for those animations. This is always time consuming as I usually have to figure out how to use new pieces of software. The goal is at the end I can go out to artists and give very specific details on the art I need and how it needs to be produced. If I do this right then the art can be dropped into the game fairly easily. If I do it wrong then the art might not work right, and in some cases must be discarded. Here’s some programmer art showing the key features. Basically we’ve brought back the separate parts from the full character model. They’re just put onto a different animation rig for first person animations. So the animations will be done for each weapon/item, and then the character arms/hands will fit into those animations. It means I’ll be able to support all of the clothing options of the full character without filling memory up with separate models/textures for the first person assets. 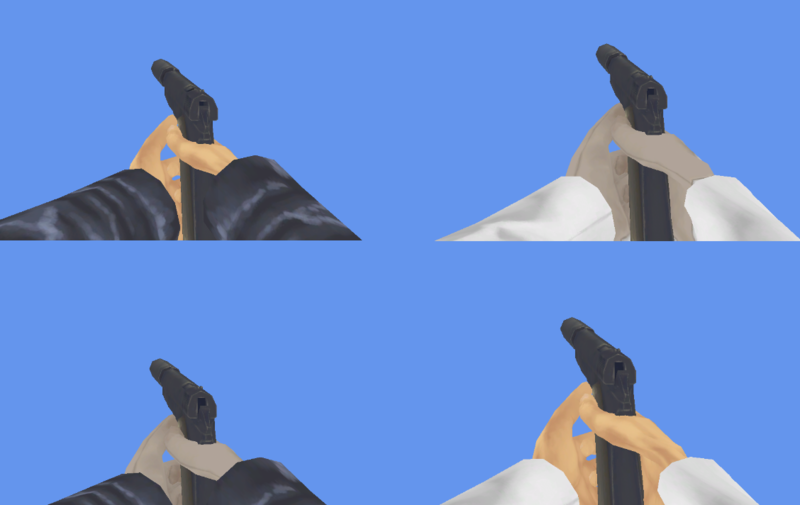 In this case we’re swapping between different arm geometry/textures and different hand geometry/textures. The spec work is basically complete and I should be able to begin the work of finding an animator to work with soon. We’re getting closer to having a test version ready. I’ve still got to get the character models into the game using the stock animations. The first person animations will not be ready for the test version, but the old Xbox versions will be in. Once the characters are in there’s probably a few weeks of fixing bugs/issues before we can do a test version. Right now I’m targeting mid/late September for testing. I’ll be looking to contract out some work on the 3rd and 1st person animations. If you’re someone who would be interested in the work send me a link to your portfolio. You’ll need to have experience using Blender for rigging and animation. You can reach me at jeff@reanimatedgames.com. In my last post I mentioned trying to decide between Steam Greenlight and Steam Direct. Well since then the choice has been made for me. Steam Direct opened up for developers and I’ve got it setup for Deadburg. This will allow me to invite people to test the game on Steam, and they’ll be able to download the game like any other Steam game. It will also automatically keep those testers updated with the latest build. In short it’s a bit step forward towards a working test version. I should note, at release Deadburg will require Steam to play. This is mostly a matter of convenience for players and myself. Steam gives me a friends list, server browser and supporting features similar to Xbox Live on the 360. If Deadburg does well then having a Steam-less version of the game is something I might pursue, depending on whether enough people want it. I’m beginning to add performance options to the game. The goal is to let players on a wide variety of hardware play Deadburg at reasonable frame rates (60fps is my goal). Right now the biggest perf issue appears to be the new shadows system, which isn’t particularly surprising. So I’ve added options to tweak the detail of the shadows as well as how “soft” the shadows appear in game. Doing so I was able to get my laptop to run the game at 1080p at 60fps with shadows enabled. There’s likely more optimizations that can be done, but it’s good enough for testing. That’s all for this month. I had to do an update for another project that ate a good chunk of June. But I’m back full time to Deadburg for July and the main goal right now is getting a version that can be tested by you folks. Sorry about the missed updates, let me catch you up on where we are now. So the Feb update mentioned a UI system that would help me build out the keyboard/mouse UI for the PC version. There was actually a lot more work to do on that system since that update. It’s a fairly normal occurrence in development that as you use something for a real product you can find the issues with the original design. That said, after a good deal of work most of the UI has been replaced, and a fully mouse/keyboard native UI is in game now. 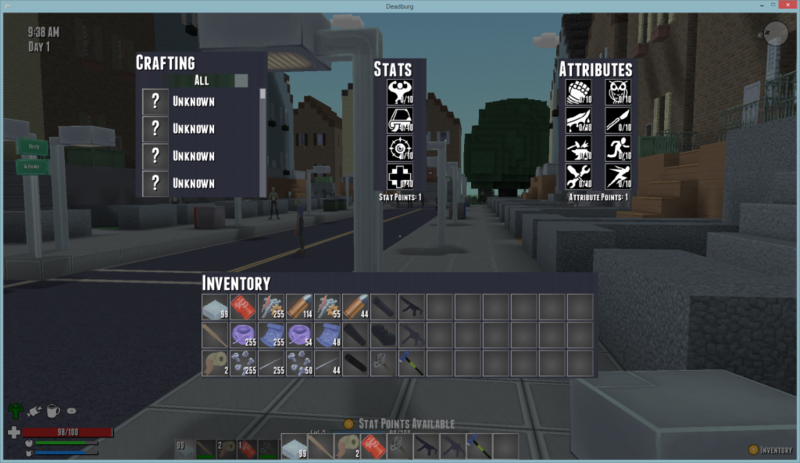 There are a few things I’m still working on, like the player HUD. But the big pieces, like the inventory and menus are done. There’s still more work to do on the look of the UI, especially in regards to graphics, but the bones are in. This means that the game’s UI is basically ready for a beta test. The big change you’ll see is the new inventory is a single screen, instead of multiple panels that you scroll through. This is something I can do now that I can use tool tip style popups instead of having to render item information on the screen. I can also scale the UI elements a little different to fit more stuff. Here’s a shot of the current state. So the Xbox version of Deadburg was built on top of the Xbox Live service/technology. On the code side this is done via “GamerServices”. This works great on the Xbox 360, but it doesn’t function at all on the PC since Microsoft closed down the Games for Windows Live program. In fact you can’t even run a game using GamerServices on a PC unless it has the XNA dev install. This means it had to go. The replacement for Deadburg will be Steam. It gives most of the functionality of the Xbox Live system, and allows me to basically drop it in without reworking too much. There’s still a lot of work to get the Steam stuff running at 100%, but as of last week I’ve been able to fully remove the GamerServices Xbox Live stuff. This means the game could actually be shared/tested by people not using a development install of XNA. It’s another step towards getting the game into your hands for testing. If you played the game on Xbox 360 there’s a good chance you saw a blue screen at one point or another. This happened if the game crashed for some reason. Some of you were kind enough to send me pictures of these screens which I could then use to try to fix the issues which caused them. Unfortunately there wasn’t an automated system for sending that information to me, so there’s a good chance I missed out on seeing all of the crashes. Now that I’m working on the PC version I can do something about that. I’ve put together a fairly simple crash reporting system that Deadburg will be using. If a crash occurs you’ll get a pop up that will allow you to send data about the crash directly to me. No e-mails/pictures required. I can then see what crashes people are hitting, how often they’re hitting them, and hopefully respond to crashes much more quickly. Steam Greenlight, or Steam Direct? In order to start the closed beta test of Deadburg, which I’m hoping you all will participate in, I’ll need to get the game onto Steam officially. Right now I’m using what amounts to a special test game that Valve created for developers to use. It won’t really work for doing a larger test. The question is to do Steam Greenlight, or wait until Steam Direct, it’s replacement, is made available by Valve. The issue with Greenlight is that it requires more polish on the visuals/display side of things, since you’re asking random people to vote for your game. I don’t think Deadburg is in a great position to do a trailer/promo reel at this time, so I haven’t put it onto Greenlight as of yet. There’s still visual polish to do and some major things like first person animations are still missing. That said as I’m getting closer to having a testable build then it’s something I may need to address if Steam Direct isn’t out by then. That’s all for this update, thanks for reading and I’ll post more at the end of June! Coming soon to the PC! Deadburg PC Update – Test Signup Closed! reanimated on Deadburg PC Update – Test Signup Closed! Coden on Deadburg PC Update – Test Signup Closed!